Hello indie rock lovers, it’s Andy Gesner from HIP Video Promo, here to share the latest clip from a young group that is already getting counted among the world’s very best. Press notices are rarely unanimous, and even popular groups have their critical detractors. That said, we can’t find a single reviewer or MP3 weblogger who didn’t hit the ceiling after hearing the new album by Grizzly Bear.Veckatimest dropped last week, and instantly justified the months of pre-release Internet buzz it garnered. Even those who’d posted to websites until their typing fingers hurt with anticipation were still blown away by the scope, ambition, and sonic grandeur of the set. Sure, it’s only May, and there’ll be plenty of great records to come in ‘09 – butVeckatimest stands a significant chance of standing as this year’s defining full-length release. And the Patrick Daughters-directed clip for “Two Weeks” will help get it there in a big way. While the group’s heady, meticulously-tailored mix of folk, experimental music, spectral Americana, chamber and choral music, and Beach Boys-style pop might seem to be a challenging fit for a club stage or concert hall, this heralded quartet is the farthest thing from a studio creation. The musicians in Grizzly Bear have spent much of the last two years demonstrating that they’re captivating live performers as well as terrific pop craftsmen, touring internationally, appearing at major festivals (including Sasquatch and Coachella), sharing stages with Paul Simon, and touring with Radiohead. Stereogum named a Grizzly Bear gig as the best show of 2007. As fascinating as Veckatimest may be, the band may be even more staggering to encounter in concert. And this is, in part – a small part, but a significant one, nonetheless – due to something other than their radiant music. We almost hesitate to add this, since it feels like a terribly superficial comment to make about a group of musicians so serious about their craft, but the consensus exists among fans, and there’s no getting around it: Grizzly Bear is a handsome band. Video director Patrick Daughters (Beck, Depeche Mode, Feist’s now-legendary clip for “1, 2, 3, 4”) doesn’t run from this reality: on the contrary, in the weird and wonderful clip for “Two Weeks”, he embraces it as hard as he can. 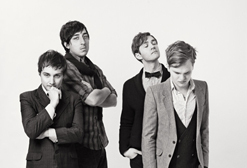 The members of Grizzly Bear are shot in a church, bow-tied, sitting in chairs, and staring at the camera. They’re made up to look artificial – like strange plastic dolls or smiling marionettes. And by running back the film at varying speeds, he captures some seriously otherworldly facial expressions: even simple blinks seem bizarre. All at once, the musicians’ faces shine from within, and when they open their mouths to harmonize, white light pours out from between their lips. Sparks shoot from their brows, flames erupt from the crowns of their heads, and by the end of the clip, the angelic-sounding band is enwrapped in heavenly radiance. We are teeming with excitement about this new video and want to thank the crew at Warp Records for bringing us on board to be a part of the Grizzly Bear team. We’ve got copies of Veckatimest for on-air giveaways and would also like to hook you up with a chance to catch Grizzly Bear when they come to your market next month. This is the hottest ticket in town and they won’t last long! If you need more info, call Andy Gesner at 732-613-1779 or e-mail us at info@HIPVideoPromo.com . You can also visit www.WarpRecords.com or www.Grizzly-Bear.net to find out more about Grizzly Bear..